Some people love pumpkin spice lattes this time of year but we are obsessed with Pumpkin Pie Spice. We use it all year round to be honest. This cake is really simple and really puts this spice on display. Every time someone we know visits a new grocery store they bring us back a new brand of pumpkin pie spice. Some people collect snow globes, some collect spices. Each brand has their own merits but my favorite is Target's brand Archer Farms, it has a perfect blend of nutmeg and clove all tied together with bay leaf and cinnamon. You can always mix your own and when we're feeling frisky we give it a go. As for the frosting I'm still experimenting on the flavor but we were given a container of Cinnamon Honey Butter so we checked the label and saw it was pure butter no oil mixed in and decided to give it a go. Using it to make a buttercream was a great idea. My only complaint was there was a little too much cinnamon for our tastes. *This will produce two thin spongy cake layers. For a thicker cake double the recipe. 1. Preheat oven to 350F degree. Take out two 9” by 1 ½” rounds and line with parchment paper and prepare the sides with butter and flour. 2. Mix yogurt, apple cider vinegar, and apple pie moonshine together and let sit while you mix the rest of the ingredients. 3. In a medium bowl sift together the flour, baking soda, baking powder, salt, and pumpkin pie spice. 4. Using stand mixer cream together butter and sugars until fluffy about 3 minutes on medium high speed. Turn down the speed slightly and add in eggs one at a time mixing thoroughly. Finally add in vanilla bean paste. 5. Turn the mixer to a medium speed and in alternating batches mix in the flour mixture and the yogurt mixture. Starting with the yogurt mixture then the flour mixture. Make sure to scrap down the sides so everything gets evenly mixed. 6. Pour the mixture into the pans evenly and bake for about 12-15 minutes. The cake should have browned on the top, pulled away from the sides of the pan, and a toothpick should come out cleanly. 7. Immediately remove the cake from the pan and invert on to a cooling rack. 8. Place your first layer on your decorating stand or cake stand. Pipe your frosting around the edge of the cake making what we like to call a frosting bumper. This will prevent your cake fillings from spilling out. Then spoon in pastry cream and spread evenly over the layer without disturbing your bumper frosting. 9. 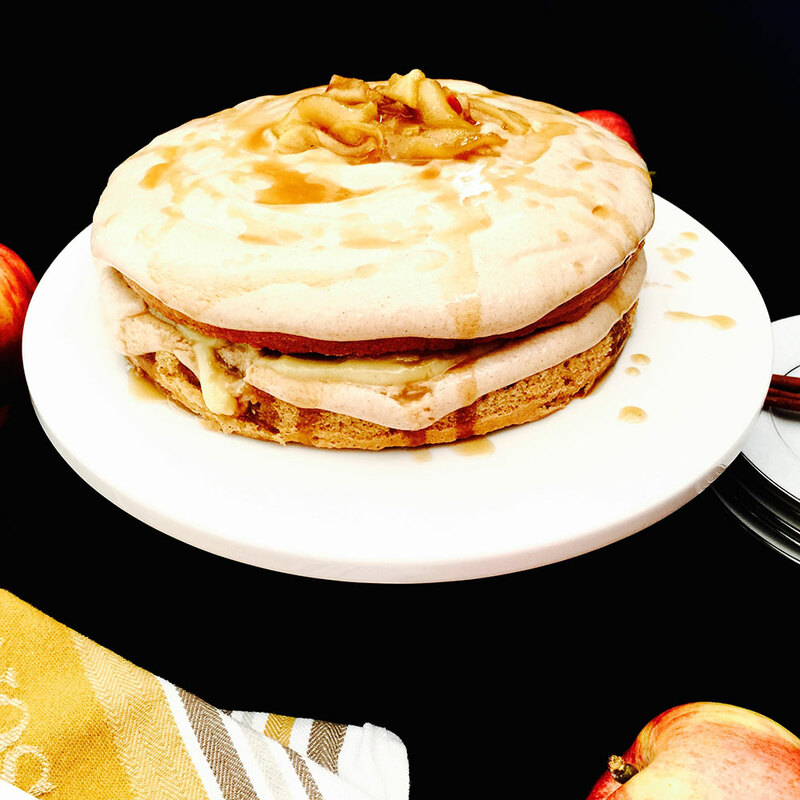 Place a generous amount of apple and caramel sauce on top of pastry cream. 10. Place second layer on top of the first layer and then frost the top of the cake any way you like. We did a naked rustic cake to leave the sides open to see all the goodness inside. 11. 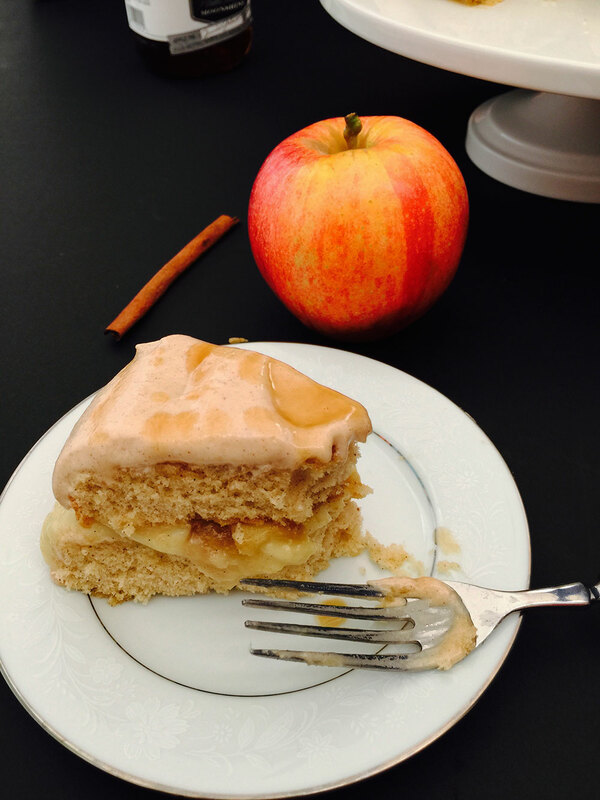 Garnish the cake with the rest of the apples and drizzle more caramel on top the cake. In a saucepan add brown sugar, butter, corn syrup, vanilla and bring to a boil over medium high heat. Once the mixture starts to boil bring down temp and let simmer for 3 to 4 minutes. Mixture should thicken. Remove off heat and let cool to a warm temp. Then slowly add heavy cream till you get a honey consistency of honey. Mix in your salt and allow to cool to room temp. 1. Place large saucepan on medium high heat add butter. When the butter melts add apples and pie spice. Cook till tender. 2. Take off heat and let cool to room temperature. 1. Beat butter and powdered sugar until extremely fluffy.